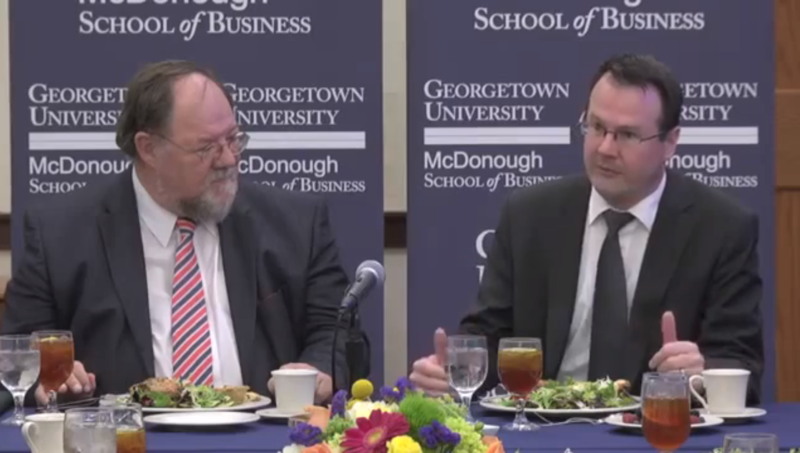 The honorable guests were invited by professor Michael Czinkota take part in a luncheon discussion with professors of McDonough Business school as well as to have a meeting with the students. During the luncheon Deputy Prime Minister presented the trends and directions that the economy of Liechtenstein is taking as well as addressed contemporary issues of the country. The discussion touched such subjects as energy stability in the region and Liechtenstein in regard of the latest developments in Ukraine. Deputy Prime Minister mentioned that the economy of Liechtenstein is a part of so-called 20-20-20 legal frameworks that aim to achieve three main targets by 2020. These targets include: a 20% reduction of green gas emissions, 20% reduction in energy use and 20% share of energy consumption from renewable energy resources. This topic is sensitive for Liechtenstein, an economy that imports around 85% of their energy resources. Deputy Prime Minister also addressed the importance of relations with neighboring economies. Zwiefelhofer emphasized the role of Switzerland and the influence of its monetary policy influence on the Liechtenstein’s export. As an example Deputy Prime Minister mentioned the situation in 2013, when a strong Swiss Frank affected Hilti, construction products, services and systems exporting company, one of the biggest in Liechtenstein. Discussing the on-going reforms in the justice system, Deputy Prime Minister noted the importance of transparency and defining strategies to reorganize the responsibilities of judges and attorneys in order to achieve highest efficiency. After luncheon, the honorable guests had a meeting with the International Business class. 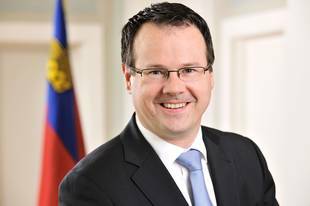 Thomas Zwiefelhofer has been Deputy Prime Minister of the Principality of Liechtenstein since 27 March 2013. Deputy Prime Minister is also in charge of Ministry for Home Affairs, Justice and Economic Affairs of the Principality of Liechtenstein.